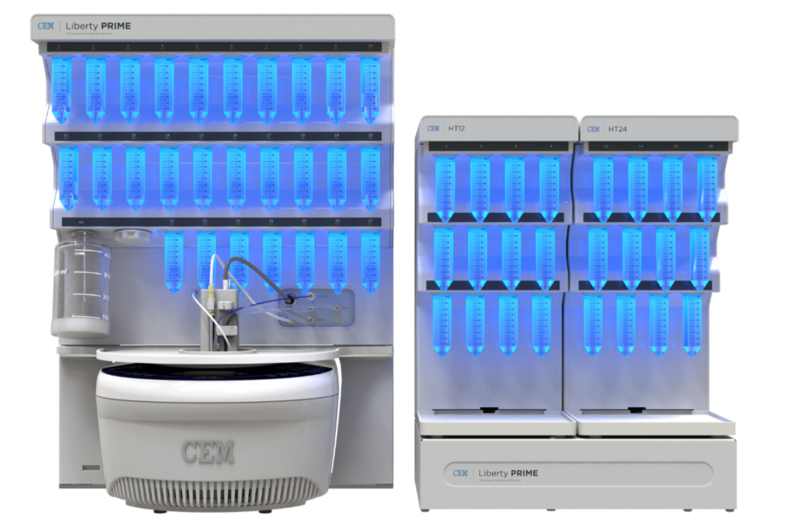 (Matthews, North Carolina) January 25, 2018- CEM Corporation is proud to announce the release of the new Liberty PRIME™ automated microwave peptide synthesizer. The Liberty PRIME is the most efficient peptide synthesizer ever made and utilizes a new methodology for solid phase peptide synthesis. It features an unprecedented 2 min complete cycle time (at 0.1 mmol scale) and produces only 50% of the waste per cycle compared to CEM’s highly efficient Liberty Blue™ peptide synthesizer. The Liberty PRIME automatically synthesizes up to 24 peptides and is ideal for high-throughput synthesis of standard and complex peptides. The improved efficiency of the Liberty PRIME is based on the development of a “one-pot” coupling and deprotection SPPS process whereby the deprotection step is initiated directly in the coupling solution without draining.1 This process results in significant time and solvent savings and is achieved with a new integrated non-pressurized pumping system for extremely accurate and fast reagent delivery. The purity of peptides made on the Liberty PRIME are at the highest level based on the use of CEM’s new patented CarboMAX™ coupling methodology at elevated temperature.2 CarboMAX improves standard carbodiimide chemistry by providing faster activation, less epimerization, and increased stabilization of acid-sensitive linkages (ex. phospho, glyco, hyper-acid sensitive resin linkages). The standard methods used on the Liberty PRIME also allows minimal epimerization of all 20 standard amino acids at 100°C even including histidine and cysteine. This allows the use of a standard method without the need for routine sequence based optimization.“The Liberty PRIME represents a major advancement in SPPS methodology and engineering over anything we’ve ever done. We are excited to see this technology be used in the market and provide benefit to the growing need for synthetic peptides” says Jonathan M. Collins, Vice President of Business Development. CEM Corporation, a private company based in Matthews, North Carolina, is a leading provider of laboratory instrumentation. The Company has subsidiaries in the United Kingdom, Germany, Italy, France, and Japan, as well as a global network of distributors. CEM designs and manufactures systems for life sciences, analytical laboratories and processing plants worldwide. The Company’s products are used in many industries including pharmaceutical, biotech, chemical and food processing, as well as academic research.